Dermalex, a clinically proven skincare range which has been developed by leading European dermatologists to aid in the relief of rosacea, psoriasis and eczema, can help relieve and reduce your symptoms, especially during seasonal transitions. 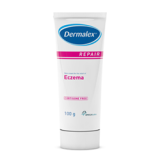 Dermalex products are cortisone, paraben and fragrance free and provide a safe and soothing solution that allows sufferers to effectively manage these chronic conditions without having to worry about harmful side effects. “Dermalex is proven to be an effective stand-alone treatment and can also be used in combination with other products. The range provides an alternative and effective new solution for optimum relief of the symptoms of rosacea, psoriasis and eczema,” says Annelies Smits, International Brand Manager for Dermalex.